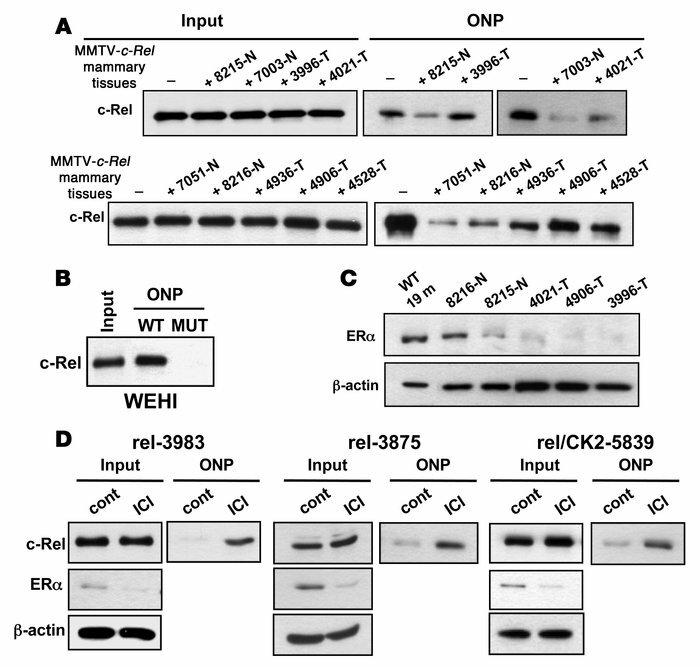 Inhibition of ERα signaling increases c-Rel DNA binding. (A) WCEs (250 μg) prepared from WEHI 231 cells were preincubated with WCEs (500 μg) prepared from the indicated MMTV–c-Rel mouse mammary tumor (T) (19-month-old mice) or histologically normal tissue (N) (2-month-old mice) or equivalent volume of lysis buffer (–) for a total of 100 μl. Samples (4 μl) were removed for analysis of input and the remaining WCE mixtures were subjected to ONP assay using an NF-κB element-containing oligonucleotide as probe and assessed for precipitated c-Rel protein (ONP). (B) WEHI 231 WCEs (250 μg) were subjected to ONP assay using an oligonucleotide containing either a wild-type or mutant (MUT) NF-κB element. Input: 15 μg WCEs was used. (C) WCEs (25 μg), prepared from the indicated MMTV–c-Rel mouse mammary tumor or histologically normal tissue or wild-type FVB/N 19-month-old mice were subjected to immunoblotting for ERα and β-actin, which confirmed equal loading of mammary tissue and tumor extracts. (D) rel-3983, rel-3875, and rel/CK2-5839 cells growing in low-serum medium were treated with 1 μM ICI 182,780 (ICI) or vehicle ethanol (Cont) for 48 hours. WCEs (500 μg) were then subjected to ONP assay, as in A. WCEs (15 μg) were used as input and subjected to immunoblotting for c-Rel, ERα, and β-actin, which confirmed equal loading.